Warhol's series Cowboys and Indians (1986). Though not as well known as his other work, these prints are significant in their illumination of America's collective mythicizing of the West. 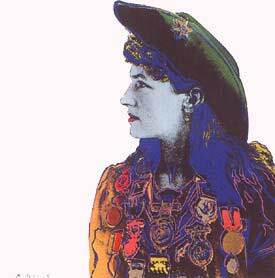 Warhol reworks a photo of America's foremost markswoman wearing the many medals which her expertise earned. The artist reddens the figure's lips and stains her hair blue-violet but retains the clarity of her gaze directed steadily toward the left. Billed as "Miss Annie Oakley, the Peerless Lady Wing-Shot," Phebe Anne Oakley Moses (1860-1926) toured the country in "Buffalo Bill's Wild West" show. As part of her act, she aimed at a dime tossed into the air and at the thin edge of a playing card, these exploits contributing in the popular imagination to the glorification of the West.